J. K. Rowling didn’t know what she unleashed when she gave us the Harry Potter books. His story is grand enough, sure, but I’m a sucker for a well-built world, and Rowling builds worlds with the best of them. So much is dropped into the Potter books that makes you want to know more about the wider world, and during those books and since she has teased us with fascinating and exciting information about the world that Harry was born into. But it’s not all about Harry, and so we find ourselves in the same world, but in an entirely different time and place. It’s 1926 and magizoologist Newt Scamander has just arrived in New York. It’s meant to be a short visit, but when a Niffler escapes from his case, he sets about trying to get it back, although while doing so he accidentally reveals his wizarding status to Jacob, a baker and a No-Maj (American word for Muggle). He is arrested by Tina Goldstein, who works for the magical government for breaching the Statute of Secrecy, and then things go from bad to worse when he realises that he’s misplaced his suitcase. This would be bad enough anywhere, but it’s full of magical beasts, and the American wizarding community is even more secretive than the British one, and they don’t take kindly to a menagerie of magical animals running around New York. However, there’s some dark magic afoot in the city and it’s believed to be caused by Gellert Grindelwald and his supporters. There’s also the issue of a group called the Second Salemers led by Mary Lou Barebone, a woman who beats her children, including adopted son Credence, and believes that witches are hidden among ordinary people and are causing all the strange events of recent times. Newt must get all his beasts back into his suitcase without causing too much of a disruption, but that’s going to be far easier said than done. I went to the cinema trying to not have high hopes, but failing miserably. The trailers had looked good, all the reviews had been positive, and the few people I knew who’d already seen it reported back great things. There’s nothing worse than hoping something it going to be great only to then have it stink. Fortunately, this is a piece of sheer cinematic magic. With no original book for us to spend the film going, “But that didn’t happen!” you are able to focus entirely on the story. The new characters all burst with magnetism. Queenie is an amazing young woman who I really loved, and Tina is a fine example of a woman who won’t stand by when she sees injustice, despite being slightly awkward and at times uncertain. Jacob, the token Muggle (I can’t get on board with No-Maj as a term), is an interesting device to be used in the story and serves as the audience surrogate to introduce us to this new world. Eddie Redmayne gives an amazing performance as Newt, a geeky, awkward, eccentric collector who by his own admission annoys people and will stop at nothing to protect animals. And while they’re all stellar performances, it is the animals that steal the show. If you’ve read the companion book, you’ll recognise everything that turns up here, and the film delights in showing us these amazing new creatures. The Niffler, Bowtruckle and Demiguise are all great and good fun (and also, let’s be honest, an excuse to sell cute merchandise) but for me it’s the Occamy and the Erumpent, my favourite animal from the book, that really shine. The film is different enough from the Harry Potter stories to ensure we’re not retreading old ground, but similar enough to make them feel like home. It opens with a short burst from Hedwig’s Theme, which is surely the anthem of the Potter generation. A chill ran down my spine upon hearing it. It’s loaded with references to the original books, some more obvious than others, and opens up many more questions about the world. New aspects of the lore are added and work seamlessly, which is more than can be said for parts of the “eighth book“. It seems that the series – for there are planned to be five of these films – will focus almost more on the Wizarding War that culminated in Grindelwald’s downfall as much as if not more than the magical beasts and Newt’s career with them. Roll on part two – something magical is happening here again, and I’m once again back and raring to go. Last year I read The Martian and by the time December rolled round, declared that it was probably the best book I had read all year. I still stand by that; it was phenomenal. When it was announced that a film was coming out, I was of course dubious because, as any bibliophile knows, the book is always better. Nonetheless, I settled in with my kids snack pack (hey, it works out cheaper!) and awaited the film. 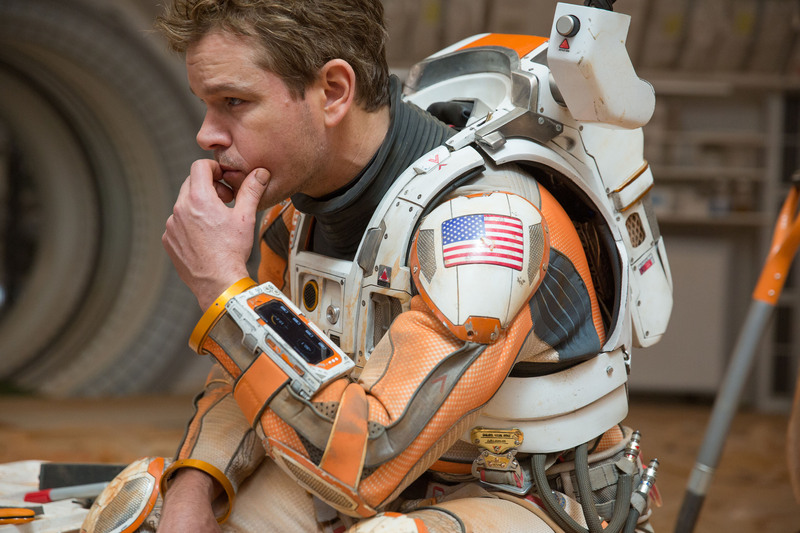 This is the story of Mark Watney, one of the Ares 3 crew, which, in the not-too-distant future, is the third manned mission to Mars. Planning to stay for thirty-one days, the crew encounter difficulties after day 6 and have to abandon the planet. However, while trying to get to their escape vessel, Mark is struck by a flying antenna and, with no choice but to push on, his five crewmates leave him for dead and return to orbiting base Hermes to head home. But Watney is not dead. Against the odds, he has survived. Now he’s on Mars, entirely alone, with no way to contact either Hermes or the Earth. He is the most solitary man in history, with only a couple of rovers and a canvas tent to call home, and with no other missions coming to Mars for four years, he must find a way to survive. Back on Earth, satellites have picked up images that relay back to the folks at NASA that Watney is alive after all. They are also faced with a dilemma about what to do, and with the whole world watching, every moment is critical. Because much of the book is one man on a planet all by himself, I had wondered how this was going to make for captivating viewing, because films with little dialogue can drag on a little (e.g. 2001: A Space Odyssey). However, I needn’t have worried. More time is given over to the NASA team on Earth who are planning to rescue him under immensely difficult odds, and Watney talks a lot to himself, recording journals for posterity. The film retains the books’ hard science fiction line, explaining (with far fewer words) to the viewer the principles of the science that Watney is using. This is crucial, because simply showing him suddenly harvesting potatoes or producing water would give it an unbelievable feel. When you can explain this away with real science (or what sounds like real science), then we are more willing to accept it. That’s the brilliant thing about this film – it feels so real. Perhaps too much so, as it seems a number of people were convinced that it was based on true events. The loneliest man in the universe. The film is far less sweary than the book, but aside from that, it seems very faithful to the original text. Some of the science and backstory is streamlined, sure, but that’s the nature of film, and enough is kept in. His journey to find Pathfinder and the Ares 4 landing site are simplified and not so life-threatening, but by this point we’ve seen him nearly die enough times. There’s also a section tacked onto the end of the film about his life post-Mars which isn’t in the book, and I don’t feel was necessary. The film was mostly shot in Wadi Rum, Jordan, where they have huge red deserts, and the landscapes are beautiful, though like many people I’ve lost the ability to tell what’s CGI and what isn’t. And if you think you know, I can assure you, more is than you think. They really do justice to the idea of total isolation, which is a terrifying prospect. As I said when I reviewed the book, it’s a wonder Watney didn’t go mad by himself, but I assume this is suspension of disbelief to allow him to stay a reliable narrator. In the book, Watney’s only source of music is Commander Lewis’ collection of disco songs, and these form the soundtrack to the film, pairing up the futuristic setting of Mars with such classics as “Hot Stuff”, “Waterloo”, “Love Train” and, of course, “Starman”. The film is altogether funnier than one would imagine of the genre, and this upbeat soundtrack helps with that. The end credits scroll past as “I Will Survive” plays. The cast are all excellent. 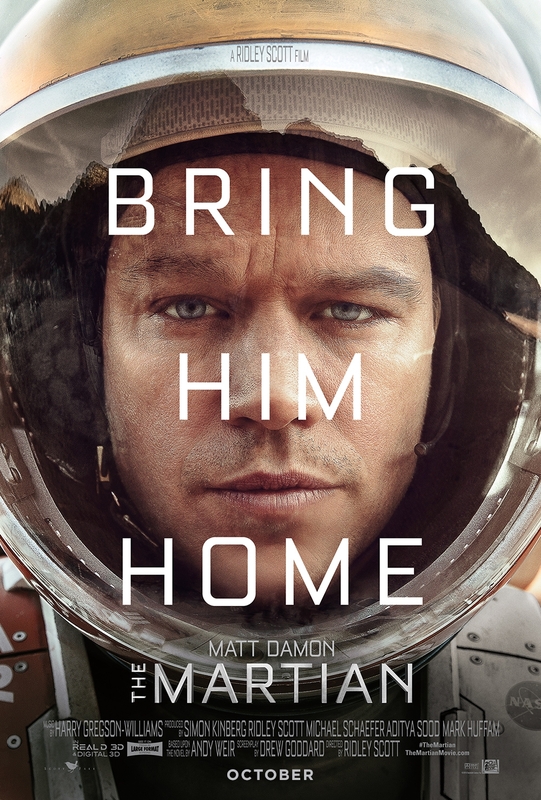 Matt Damon is great as the tenacious, courageous Mark Watney, the NASA team, including Jeff Daniels, Sean Bean, Chiwetel Ejiofor and Kristen Wiig, are all suitably different and entertaining with their own ideas, ideals, motives and quips. A massive round of applause feels necessary for Sean Bean who manages to make it through an entire film without being killed. It’s a tense film, but one well worth watching. As usual, the book is still a little bit better, but this is one of the closest comparisons between versions I’ve ever seen. A very beautiful film. This is and, for as long as I keep doing it, will always be primarily a book blog. Books are the main media I consume, so it makes sense to write about them. But believe it or not, I do occasionally experience other things. I’ve already reviewed a show, so now it’s time to bring a film under the spotlight. After all, the blog title says “fiction” – it doesn’t specifically say anything about books. As such, I’m about to review Jurassic World. Before you continue, I’ll just give fair warning that this review will contain spoilers, so if you haven’t seen it yet, maybe wait before reading on. So we find ourselves on Isla Nublar, which is now running a fully functioning dinosaur theme park. 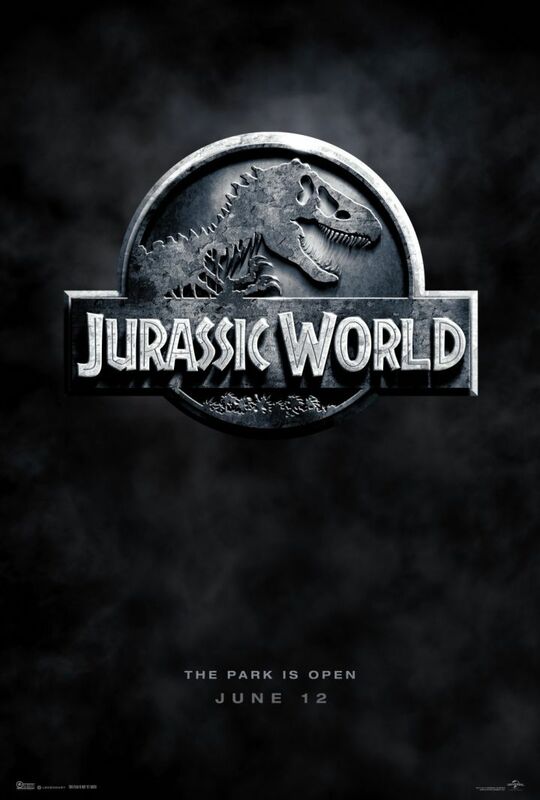 Our main characters include Zach and Gray, two young boys who have come to the island to experience the magic and wonder, their aunt Claire who is one of the park’s directors and very focused on public opinion and the financial running of the park, and Owen, a trainer who appears to have formed a close bond with the Velociraptors, getting them to obey him. Because dinosaurs no longer supposedly have the “wow factor” that the park’s bosses want, the scientists, including Dr Henry Wu from the first film, have been cooking up stuff in their lab. They have come up with a new creation, the Indominus rex, a creature based on a Tyrannosaurus rex, but with a whole bunch of other classified animal genetics thrown in. Due to the fact that a theme park with real life dinosaurs in it is never a good idea, this all very quickly goes wrong. The Indominus rex breaks out of her enclosure after showing enough intelligence to trick her human captors, and soon she’s on her way to the centre of the park, where twenty thousand human visitors are located, and it seems that nothing is going to stand in her way. As a big fan of the first films (well, the first and third ones anyway, I never much cared for the second), I was hugely excited about the prospect of a new film, although also very wary. Thankfully, it’s a really great movie. Considered a sequel to the first film, the original two sequels seem to have been forgotten about, although apparently they are canon just not mentioned. Jurassic World seems to enjoy throwing in references to the original film and it’s fun to try and spot them all. There’s a guy wearing a shirt with the logo of the original park on it, a repeat of the classic Dilophosaurus moment, someone saying that the park “spared no expense”, and also a prolonged scene in the first visitors’ centre, which appears to have been left to the elements after a very quick evacuation. Despite all this, only three characters make an appearance from the first film – the aforementioned Dr Wu and … I won’t say the other two. You’ll see. Alright, so the characters are basically stereotypes, but they do get deconstructed throughout and it works well, and the action scenes are second to none. It’s such a beautiful film, I’m happy to believe that the dinosaurs are really there. Do I completely get the notion that someone has managed to (almost at least) tame the raptors? Not really, but it’s a fun idea. The Indominus rex is a thing of wonder, and further emphasises the muddy waters we’re playing in when it comes to genetic experimentation. They’ve even managed to get away with ignoring the last twenty years of dinosaur research and discoveries by handwaving that the dinosaurs may look very different if they had a whole genome to work with, rather than having to fill the missing its in with bits of frog, toad or snake. If you want an all-action, scary, funny and incredibly entertaining film, then go see it, because it may be full of cliches and archetypes, but no one really minds all that much. It’s a film about dinosaurs – is that not enough?